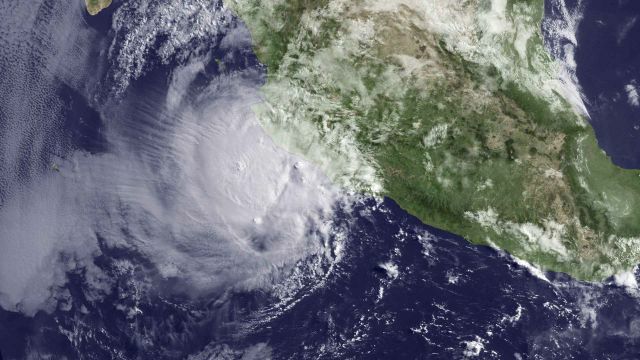 Hurricanes are uncommon in the Eastern Pacific in May; there have been just twelve since record keeping began in 1949—an average of one May hurricane every five years. If Bud ends up making landfall in Mexico as a hurricane, it would be only the second Eastern Pacific May hurricane on record to hit Mexico. 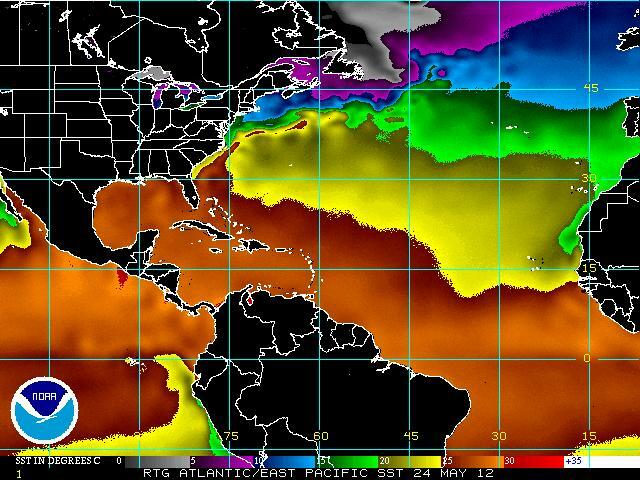 Sea surface temperatures on 24 May 2012, in degrees Celsius: NOAA Masters also notes that sea surface temperatures (SSTs) this year in the Pacific where Aletta and Bud formed are slightly above average… though he concludes that large-scale atmospheric patterns are the more likely cause of this year’s exceptionally early start to hurricane season in the Eastern Pacific. 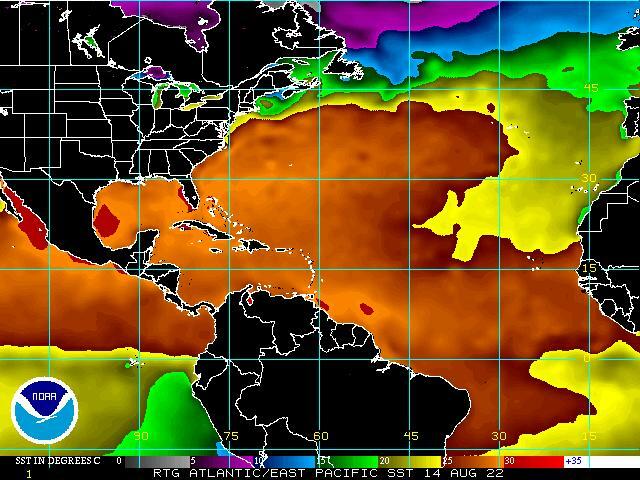 Near-average SSTs are one factor NOAA is citing in its prediction for a near normal hurricane season on the Atlantic side this year—with 9 to 15 named storms, 4 to 8 hurricanes, 1 to 3 major hurricanes, and an Accumulated Cyclone Energy for the season ranging from 65 to 140 percent of the median. 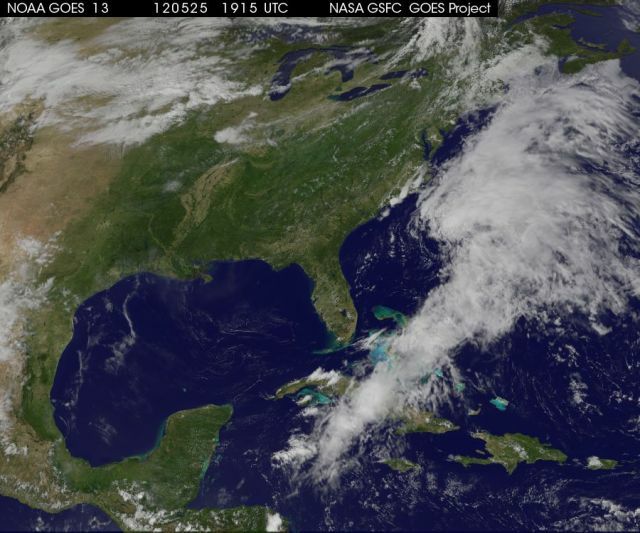 94L at 1915 Zulu on 25 May 2012: NASA | NOAA | GOES Project Science At the moment the National Hurricane Center is following a system called Invest 94L 275 miles southeast of the Carolinas. There’s currently an 80 percent chance this system will develop into a tropical or subtropical cyclone in the next 48 hours and turn west into the US coast over the weekend. The good news is that 94L, which may develop into Beryl, will likely bring relief to the severe drought underway in the US Southeast. Big Hurricanes Beget Big Earthquakes?